Graham Philips goes on to attribute the Nile turning to blood to the eruption of Thera. Exodus 7:19 states, “And all the waters that were in the river turned to blood”. Thera had corrosive toxin in its bedrock: iron oxide. Wilson points out that in the submarine eruptions that still happen at Thera, tons of iron oxide is discharged that kill fish for miles round. Over the years, scholars have attributed the plagues described in Exodus to different natural phenomena. The darkness could have been due to a particularly violent sandstorm; the hail could have resulted from freak weather conditions; and the bloodied river may have been the result of seismic activity far to the south of tropical Africa. According to the Exodus story, the Israelites are led out of Egypt by following a “pillar of cloud by the day” and a “pillar of fire by night” (Exodus 13:21). Graham Philips attributes these phenomena to the Thera plume. The towering ash cloud over the volcano itself rose more than 48 km (30 miles). It would have been visible from the delta of Lower Egypt, given the curvature of Earth. If the Israelites had attributed the phenomena to the intervention of God, then they may well have started the exit following the direction of the sky sign, in the belief that it was a beacon leading them out of Egypt, to safety. According to Exodus 13:18: “God led the people round by the way of the wilderness towards the Red Sea”. The earlier interpretation of the Hebrew words “Yam Suph” as the “Red Sea” seems to have been incorrect. In fact, according to Phillips, it could mean “sea of reeds” or “sea of seaweed”, which could describe an expansive, large, shallow lake that is covered by reeds here and there. My theory is that Lake Burullus is more likely to have been the sea of reeds in the north of Egypt; it is perfectly situated along the exodus path. Lake Burullus is separated from the Mediterranean by a narrow ridge of dry land some 50 km (31 miles) long and is finally connected to the Mediterranean through a shallow inlet. 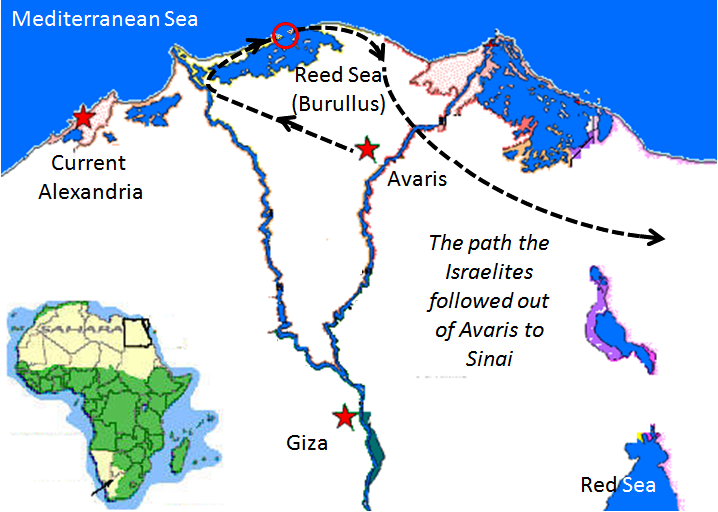 From Avaris—south Mansoura city—the Israelites could have reached west of Lake Burullus within a couple of days by following the sign in the northwestern sky. As the sky sign moved past the Israelites, they realized that they would have to travel eastward i.e. around the lake at the Rasheed village; where the French expedition to Egypt, two centuries ago, found the famous Rosetta stone. The Israelites turned to the east instead of continuing west. They walked on the Burullus ridge. They reached the shallow inlet, 1,100 meter (3,600 feet) long and 200 meter (656 feet) across and 5 meter (16 feet) deep that connects Lake Burullus to the Mediterranean Sea, and they had to cross it. If the shallow inlet connecting the lake to the sea, usually underwater, had receded because of the tsunami force resulting from the Thera eruption, the phenomenon might indeed have saved the Israelites as the Egyptians were in close pursuit. The inlet would have turned into dry land and Lake Burullus, or the sea of reeds, would have been temporarily disconnected from the Mediterranean, as the Bible relates in Exodus 14:21 : “And the Lord caused the sea to go back by a strong east wind all that night and made the sea into dry land and the waters were divided”. Exodus 14:25 tells us that when the Egyptians tried to pursue the Israelites across the sea of reeds they were hampered by the ground clogging of their chariots wheels, so they drove heavily. The tidal wave caused by Thera’s eruption would have finally helped the Israelites to escape untouched. The pursuing soldiers may have attempted to follow when the tsunami tidal wave hit, washing them away. Exodus 14:29 tells us, “And the waters returned and covered the chariots, the horsemen and all the host of Pharaoh who came into the sea after them; there remains not as much as one of them”. Several scholars consider it unlikely to have darkness, fiery hail, sores, a bloodied river, dead cattle and fish, swarms of locusts, flies and infestations of lice; all happening at the same time. However, I believe that there is another explanation for these events. What if the sky sign was the trace of a passing asteroid? Asteroids are sometimes called minor planets or planetoids. They are smaller than planets but larger than meteoroids. What if it was a comet exhibiting a coma, or tail of gases and hail? This could very well fit into the Bible description of “a pillar of cloud by day” and “a pillar of fire by night”. This could explain the sky sign that the Bible claims guided the Israelites out of Egypt. Not only could its magnetic pull have tilted the Inner Core magnet of the Earth, causing great Earthquakes, such as the Thera eruption, but could have also reduced the vertical component of the magnetic force and thus slowed down its rotation, forcing the planet to retard, so that one night lasted three days long. “And Moses stretched forth his hand toward heaven; and there was a thick darkness in all the land of Egypt three days”. The fiery hail covered the Egyptian sky, could have finally found its way to the Nile and turned it red. Depending on the mass of the planetoid and its speed and distance from the Earth, a negative pressure could have developed in the atmosphere at the point of proximity. A plume of air could have developed with a crest that pointed to the planetoid. Such a suction of air would have created a low atmospheric pressure at the surface of the Earth. This would have brought gale winds storming from the East to try to balance the drop in pressure “And the Lord caused the sea to go back by a strong east wind”. But, where did this planetoid come from, and where did it go? Is it going to come back again? Had it visited our solar system before? When and at what frequency? Wilson, I. (1985). Exodus Enigma. Weidenfeld & Nicolson. Philips, G. (1998). Act of God Tutankhamen, Moses and the Myth of Atlantis. HB Sidgwick & Jackson, PB Pan . Thera and the Exodus, my book on the same topic, supports the theories by Wilson and Phillips, but also presents much additional information about the Exodus and all the role players. I do not support Wilson and Phillips views in many parts according to my analysis. The route of the Exodus is different as well as the time line. The cause of the “pillar of fire by night” and “pillar of cloud by day” is not attributed to the eruption of Thera. The reason behind Egypt going into complete darkness for 3 days is not the eruption ashes blocking the Sun light. The location where crossing the sea took place was neither at the Red Sea nor the Manzala Lake, … and more. While this page explains the citation of the Old Testament in a totally new way, the scientific background is manifested over the rest of this site pages. More depth is also available in my book titled “More Than 60 Minutes- When Earth Stands Still” …. Your theory about a the tail of a comet causing the biblical plagues is intriguing, but does not explain certain aspects of the plagues of Egypt. For instance, most researchers agree that if the Exodus had indeed occurred, the walls of water which collapsed during the drowning of the Egyption army in the sea must have been caused by a tsunami resulting from an eruption of Thera. The description of the plague of darkness in the Bible and also Ginzberg’s Legends of the Jews leaves no doubt that it could only have been caused by an ash cloud descending upon Egypt (see my book). For the following of a sign in the sky, which you propose as an explanation of the pillar of fire/cloud, please see my article called “The Star of Bethlehem” on my website (http://www.riaanbooysen.com/the-star-of-bethlehem). Here I show that it is mathematically impossible to follow a celestial object to any particular location on earth, implying that the Israelites could not have been guided by an object in the sky. While in my book I agree that, at the crossing time, the sea experienced abrupt retreat followed by a tidal wave due to Thera eruption, there is also another possibility for sea level to violently vary. If Earth spin speed went slower, or even stopped spinning, sea level at the lower latitude would drop while sea level at higher latitude would increase and vice versa. The cycle of change is explained and is based on 1) the model I introduced to illustrate what makes Earth spin https://planet-earth-2017.com/what-makes-earth-spin/ and what causes the spin speed, when measured over the last 400 years to vary by a couple of hundred milliseconds up and down every year for instance and 2) ancient texts out of the holy citations as well as Avestic Aryans, Toba Indians, Aztec and Mayans https://planet-earth-2017.com/the-hour/ and 3) geology evidence of Magnetic Plasmoids that started to form at the Antarctic region some 10,000 years ago https://planet-earth-2017.com/the-true-source-of-earth-magnetic-field/ . All but connecting, in a cause and effect manner, the changes that the planet experiences every 3,562 years. I agree with you that Stars can in no possible way create the effect of Pillar of Fire or Pillar of Cloud. However, a comet, planetoid or even a fast moving planet, that appears as visible as the sun and the moon when watched from Earth and is accelerating towards and around the sun, could. In November 2010, the scientific journal Icarus published a paper by astrophysicists John Matese and Daniel Whitmire, who proposed the existence of a binary companion to our sun, larger than Jupiter, in the long-hypothesized Oort cloud. In November 2011, in a press conference, NASA announced that they will use its Wide-field Infrared Survey Explorer (WISE) to try and locate such a hypothesized planet! I have to state that I cannot seriously consider the earth ever having stopped spinning. As for the existence of the hypothetical planet that might have been visible in the sky, it would have been as impossible to follow as it would be to follow the planet Venus, which has often been suggested as the Star of Bethlehem – I again have to refer you to my article. Lately planets Saturn http://www.newscientist.com/article/dn9100-saturns-rotation-puts-astronomers-in-a-spin.html and Venus http://www.universetoday.com/93494/is-venus-rotation-slowing-down/ have started to slow down. I explain in my book how all Planets of the solar system enjoy similar geo-physics and therefore can explain how temperature belts are formed and how they get tilted, what makes a planet to spin in different speeds and directions, what makes Earth magnetic field to appear to be weakening, what creates patches of weak south magnets at Antarctica where the strong north magnet emerges, .. and more to find as you sequentially peek through each page of this site. I accept to be wrong but would invite Scientists and Scholars to specify what flaws are there in the new model of the geophysics of our planet. I needed to hypothetically stop the earth spinning and rotating around the sun in order to define the ‘looking up’ problem. I do not for a moment suggest that this had actually happened. Venus may indeed be slowing down, but once it has stopped rotating, which may be billions of years away, I cannot see how it could ever start picking up speed again. The problem with the biblical reference (Joshua 6) is that it suggests that the earth stopped rotating for a whole day on Joshua’s command, and then resumed again. This is an absolute and total impossibility. Please do me a favor and read the pages of this site. The whole is bigger than the sum, you will agree. As one electrical engineer to another, I am confident that you will appreciate the model that explains what makes Earth spin. What makes it slow down, stop spinning or even reverse its spin, and what makes it pick up spin speed again. I will not be able to judge the accuracy of your model, but I cannot for a moment believe that the Earth could stop spinning, etc. Perhaps you should test your theory with some scientists in the field.